Nail A College Drop Out: Cold. Hard. Metal. In recent days I haven't had a ton of spare time to paint my nails and I have to say I genuinely miss it! I've been working on some pretty damn awesome sketches, but until I get to those babies I've an ice cold metallic gradient for you! How did I create this icy cold look? I started with two coats of Pure Ice's limited edition velour finish Ruffled Sheets as a base and dabbed on Pure Ice Get Low—to the windows! To the walls! To the sweat drop down my... Oh, this isn't the right time for a Ying Yang Twins reference? Not even a little one? *shrugs shoulders*—until I felt it was sufficient in opacity. 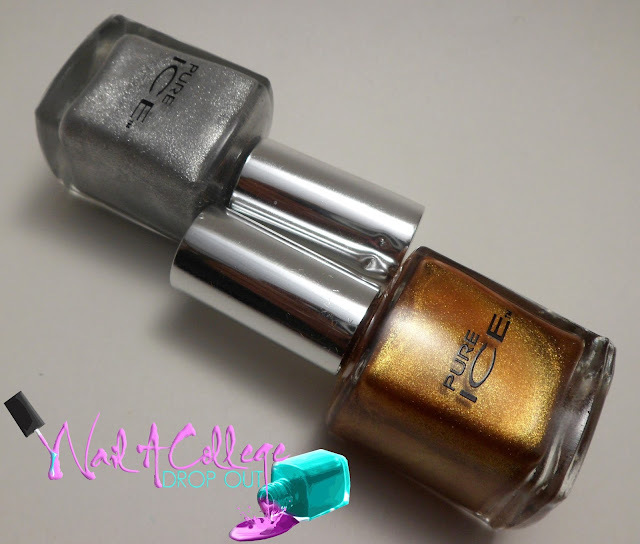 Pure Ice lacquers are available at Walmart nationwide and retail for $1.97. Why are my nails so short? The untimely death of my thumb nail. I'm really looking forward to warm weather, long nails, and a new job closer to home.